The goal of the Mobile Quiz Game project was to investigate which of the commonly used gaming elements resulted in the highest rankings in terms of fun and re-playability. These elements include multiplayer functionality, adaptive gameplay, or different levels of challenges. 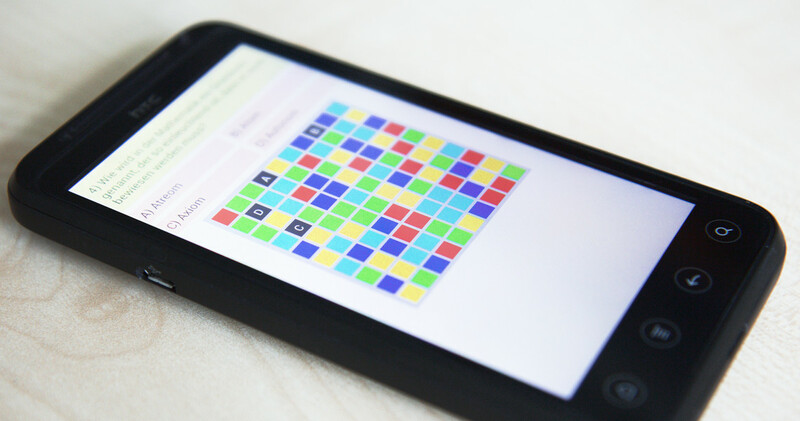 All aspects can be dynamically switched on and off in an Android-based quiz game. One reason for developing learning games is their strong motivational aspects. However, when dealing with limited resources as most serious games developers do, it is important to pick aspects that promise the best ratio between development effort and motivational outcome. For example, next-gen graphics, as seen in modern action games, yields high motivation to play the game, but it also requires a lot of effort to make a game look as good as commercial games. Then again, simple multiplayer aspects, as seen in recent mobile games, also result in a high motivation to play the game while the development effort may not be that high. The goal of the Mobile Quiz Game project was to investigate which of the commonly used gaming elements resulted in the player having the most fun, and desire to play the game again.